"Are you a 'player' or a 'watcher'?" 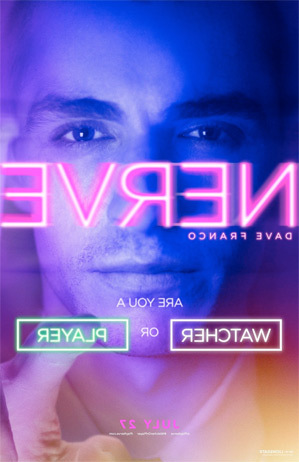 Lionsgate has debuted the first official trailer for a crazy new technology thriller called Nerve, which is about an "online game" that two people get sucked into and it turns out it's more real than they thought. This is another one of those cheesy setups where you wonder if the people who wrote this have ever actually used the internet, because of course it turns into a thriller where you don't know how much the people after you know about you. Emma Roberts and Dave Franco star as the two people who end up trapped by this game. Hmm, I wonder if Franco has anything to do with what's going on? I was expecting something better from the two guys behind Catfish, because this looks painfully mediocre. A high school senior finds herself immersed in an online game of truth or dare, where her every move starts to become manipulated by an anonymous community of "watchers." Nerve is directed by American filmmaker team Henry Joost & Ariel Schulman, who broke into the industry with their documentary Catfish at Sundance in 2010; they followed that up with a "Catfish" TV show for MTV, and directed both Paranormal Activity 3 & 4. The screenplay is written by Jessica Sharzer, adapted from a novel of the same name written by Jeanne Ryan. How did this come from a book? Lionsgate will release Joost & Schulman's Nerve in theaters everywhere starting July 27th this summer. Interested in this movie? Would you play? Very cool concept and trailer if you ask me, I'm intrigued. For what it is and the target audience it looks different. Yeah, every reality show should turn into (and is) a thriller. I hope it won't be the cheap one. And I just want to know how brave this concept will get. It was probably pitched as "Fincher's The Game for the snapchat generation." kinda like an earlier version of gamer.